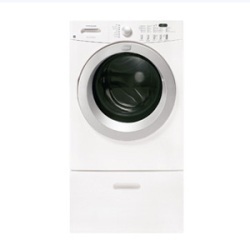 Frigidaire FAFW3517KW Affinity 7-Cycle White Washer 3.5 Cu. Ft. The FAFW3517KW is a 3.5 cu. feet capacity washer that comes with a number of useful features like the WashSense Technology and Advanced Rinse technology. The WashSense technology is responsible for giving clothes a good clean. The Advanced Rinse Technology allows you to enjoy clothes with no traces of detergent or soap. The Balance Control System reduces the amount of vibration in the machine by distributing the balance evenly in the drum. This makes the unit ideal for use in the second floor. Express Select options allow you to choose the programs you want with the push of a button. The Quick Cycle feture makes quick washes possible. You can wash small loads in as fast as 25 minutes. The Add-a-Garment feature allows you to add a garment even if the load is already in the middle of a cycle. The TimeWise Technology helps ensure faster washing and drying times. The Save Your Settings feature allows you to save your favorite settings for your next load. NSF certification and sanitary wash cycles give you super clean garments. The NSF certification means that the machine can clean clothes in temperatures that ensure removal of 99.9% of bacteria. The Delay Start option allows you to set the time you want the machine to power up and start washing. The stainless steel tub design resists rusts and chipping paint. The End of Cycle signal tells you if the machine is done running. Optional drawer pedestals allow users to adjust the height of the machine according to what’s most comfortable for them. Its NSF certification is the main reason why this is such a good washer, as loads come out clean and fresh. The delay start feature also makes this machine perfect for those who are very busy. They can set the timer so that a clean batch of laundry is waiting for them when they come home. Another advantage is the stainless steel tub. Unlike other machines with plastic or porcelain tubs, the stainless steel tubs are strong enough to withstand faster spin cycles and can resist rust. Another plus is the quick cycle option, which allows you to wash and go. With this cycle, you can wash loads in as quick as 25 minutes. A common complaint with the model is that the electronic controls tend to give way first. You cannot view the cycle indicators and cannot see what program the machine is set to when the controls are broken. Another downside is the small capacity, which makes this not very ideal for larger families. The drum also develops a musty odor when not cleaned regularly.